This book is a mashup of Mary Shelley’s Frankenstein, videogames and Internet culture, of chiptune music, galvinism, taffelmuzik, real life accounts of ’90s gabber rave parties in Italy and a celebration of Bologna’s finest weirdo label SONIC BELLIGERANZA, whose 17 years of existence (2000-2017) this volume celebrates with 17 texts. The author, having whistled countless 8-bit versions of famous pop songs and delighted his ears with chip-tune covers of black metal songs and classical music, now extends micro-music aesthetics to literature with this remix of Mary Shelley’s classic. Through some sort of low-resolution séance, the author evokes the spirit of corpse reviver Giovanni Aldini (1762-1834), credited with having inspired The Modern Prometheus. 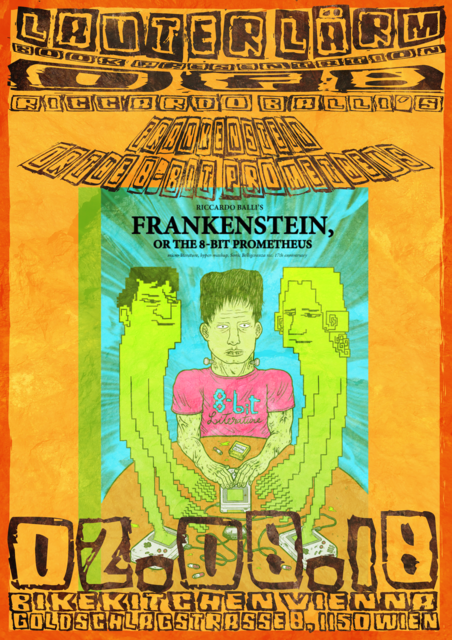 Aldini tells a compressed version of the original Frankenstein story, exposing its language to retro-gaming jargon and simplifying the plot as if it were an arcade game. The aforementioned 18th-century electrifier was the nephew of eminent scientist Luigi Galvani, who lived in MIDIevil Bologna just like the author of this new classic.